I’m a huge fan of fire. In fact, when we first moved to Guatemala—before I even knew Spanish—I played with the neighborhood kids. The one thing we knew how to do was to light things on fire. I didn’t even know the Spanish word for “matches”…but I got by. Ya, fire has been a big part of my life. So any chance I get to light a fire or grill something, I take it. 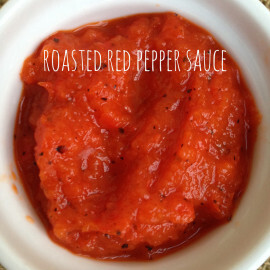 This roasted red pepper sauce is the perfect opportunity.